Home » Blenders & Juicers » What is the Best Juicer Under $200 in 2016? Having a delicious and nutritious glass of fresh juice from a variety of fruits and vegetables doesn’t necessarily mean going to a juice shop for it. You can get just as good a glass when you make it at home and it costs a lot less. All you need is a good juicer that is efficient, easy to clean and durable. If you juice often enough, you’ll easily save enough to pay it off, and while some of the best juicers available in the market today can cost more than $300, a $200 one is more than enough for most needs. But what is the best juicer under $200 for your home? To figure that out, let’s first brush up on the difference between centrifugal and masticating juicers. Centrifugal juicers essentially grind the fruit or vegetables into a pulp and then the high speed spinning action separates out the juice. A masticating juicer crushes fruit and vegetables, much like how our teeth chew on food. In doing so, it presses the juice out, leaving behind dry pulp. Centrifugal juicers are noisier, work at high speeds and are best for softer fruits that contain a lot of juice. Masticating juicers are fairly slow and quiet and are much more efficient getting juice out of leafy greens and harder vegetables. In fact, if you are buying a juicer specifically for something like wheatgrass, you’ll want a masticating juicer over a centrifugal type. Juice fanatics will also tell you that you can’t get the best quality juice and least wastage with anything less than a masticating juicer. While that is true, many high end centrifugal juicers come close and they work a lot faster than masticating ones. Besides, the only really good masticators less than $200 are refurbished ones, except for maybe the new Gourmia GSJ200. If you’re willing to pay more, we have selected the best juicers for a variety of budgets. You can find some of the best juicers under 200 dollars on Amazon, but we’ll narrow it down for you and even include one masticating juicer within this budget. 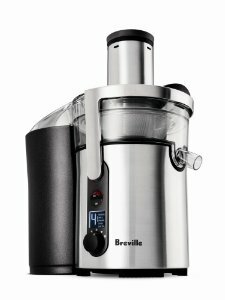 The Breville BJE510XL Juice Fountain, is top of the line when it comes to centrifugal juicers. The control panel is backlit and the 5 speed dial lets you dial-up the perfect speed for any juicing task at hand, from soft fruits to hardy vegetables. There’s a built in smart chip that senses the heavier load when you feed it a hardy vegetable and automatically increases the speed of the cutting disc to get maximum amount of juice out. While most centrifugal juicers can destroy a lot of the nutrients because of extra heat forming at high speeds, this Breville’s patented technology minimizes transfer of heat to the produce and juice. The extra wide feeder chute allows for larger pieces of material to be pushed into the juicing compartment. That means less chopping and more juicing. A patented direct central feed system, extra sharp cutting blades and strainer mesh maximise juice output. It comes with a cleaning brush, a 1.2 liter juice jug, large pulp container with handle, a froth separator and a detachable spout so you can juice directly into a cup if you so desire. There are several built-in safety features and everything except for the blades and mesh and food pusher can be washed in the top shelf of a dishwasher, so clean up is easy. Overall, this is the best juicer under 200 dollars. Juicing went mainstream when the Jack Lalanne juicers came out, and this JL 100th Anniversary Countertop Machine is just about as good as a centrifugal juicer gets. This is one of the quieter centrifugal juicers out there, and even though there are only two speeds, low and high, it still juices with the best of them using stainless steel blades. The 2.8 inch feeder chute let’s you minimize chopping when adding pieces, and the 800 watts of power is plenty to get the job done. It comes with a pitcher to hold your juice, or use the convenient spout for juicing directly into a glass or cup. When done, this spout can be turned upwards so as to prevent drips. You also get a juicing guide so you can maximize this gadget’s abilities. If you want power and speed control above all else, the Cuisinart 1000 Watt 5-Speed Juice Extractor will fit the bill. Versatility is the name of the game, and with 5 speeds, you’ll be able to select the proper speed for any juicing job you may have. As far as performance goes, it’s hard to beat. It is also easy to operate with an LED lit control dial and easy unlock and lift mechanism to disassemble the parts. You’ll get a foam reducing filter basket, a 1 quart juice pitcher, 2 litre pulp container, stainless steel parts that are all dishwasher safe, and an anti-drip spout with flow control for juicing directly into a glass. A cleaning brush is also provided. Plus, it has one of the best limited warranties on this list at 3-years, which attests to its durability for the long haul. If you are looking for a juicer that is compact and great for making one or two glasses of juice to drink right away, the Omega 4000 Pulp Ejection Juicer is the one for you. It is the slowest juicer here, being powered by only a 250 watt motor, but that motor comes with a full 15 year limited warranty. It is quiet, tough and durable, and works well with most fruits and vegetables. However, you may find getting the pulp out of the strainer not as easy as with the above models. It does not come with a pitcher and some other accessories, but the spout allows you to juice directly into a glass, cup or a pitcher of your own choosing. Although it is one of the least versatile juicers at this price range, the bullet proof construction means it will outlast almost every other juicer that you can find. You won’t find a better one at this price, and if this is where your budget is, then the Breville JE98XL Juice Fountain can’t be beat and a good choice for those who like Breville appliances but don’t want to spend too much. Most of the features are the same as that of the Breville BJE510XL model above except for the 850 watt motor with two speeds instead of 5 to make it easy to juice just about anything you put inside, and a high grade polymer body instead of stainless steel. The huge feeder tube lets you put in whole apples, oranges, pears, whatever, and you won’t have to cut any of them into chunks before juicing and you can get a cup of juice in 5 seconds! It’s dishwasher safe and comes with a 1 liter juice jug, a froth separator, a filter basket and a cleaning brush. And, it is one of the quieter and more powerful centrifugal juicers here. If you are into juicing leafy vegetables, wheatgrass and other harder types plants, your only real option is a masticating juicer. The problem is that most of them cost hundreds of dollars in price. The alternative to that is to go and get a certified refurbished unit, and there are none finer than the Omega Juicer VRT350X Dual-Stage Single Auger Low Speed Refurbished Juicer. This masticating juicer rotates at an optimal 80 revolutions per minute, and that ensures that you’ll get all the juicing goodness out of even the toughest to juice plants. It’s a vertical masticating design, called a VERT, unlike the horizontal types, so it will even save room on your counter top too, and the spout will allow you to juice into any container that fits below it. There is a coarse and fine mesh screen so you can control the amount of pulp you want in your juice. Masticating juicers are known for their quiet operation, and this one is no exception. You’ll get very efficient and high yield results, and it comes with a 7 year limited warranty as a testament to its durability. The only complaint that a few users have is that this isn’t the easiest juicer to clean. ← What is the Best Raclette Grill to Buy?